Ancient Gadara has been described by a former Jordanian villager who once lived there as a town “without a soul.” The reason for his description is explained by Sunny Fitzgerald in a recent issue of BBC Travel. In the 1960s, Jordan’s Department of Antiquities declared Gadara an archaeological site; it’s now awaiting consideration for Unesco World Heritage status. The local citizens were moved from the ancient site, but they still visit it for the beautiful scenes of the Sea of Galilee and the Yarmuk valley below Umm Qais. View of the Sea of Galilee in the late afternoon from Umm Qais (Gadara). Notice the slight red sky showing through the haze. Photo by Ferrell Jenkins. Fitzgerald’s illustrated article is a fascinating one that I highly recommend that you read it. Umm Qais (a common spelling; also Umm Qeis and Um Qays) is the site of Gadara, one of the cities of the Greco-Roman Decapolis. The late Mendel Nun discovered 16 ancient ports around the Sea of Galilee, including one for the city of Gadara. The port is located at Tel Samra on the southeast corner of the Sea of Galilee at the modern Ha-on Holiday Village (Mendel Nun. “Ports of Galilee.” Biblical Archaeology Review 25:04; July/Aug 1999). From Umm Qais (Gadara) one has a great view of the Sea of Galilee and the Yarmuk River valley. 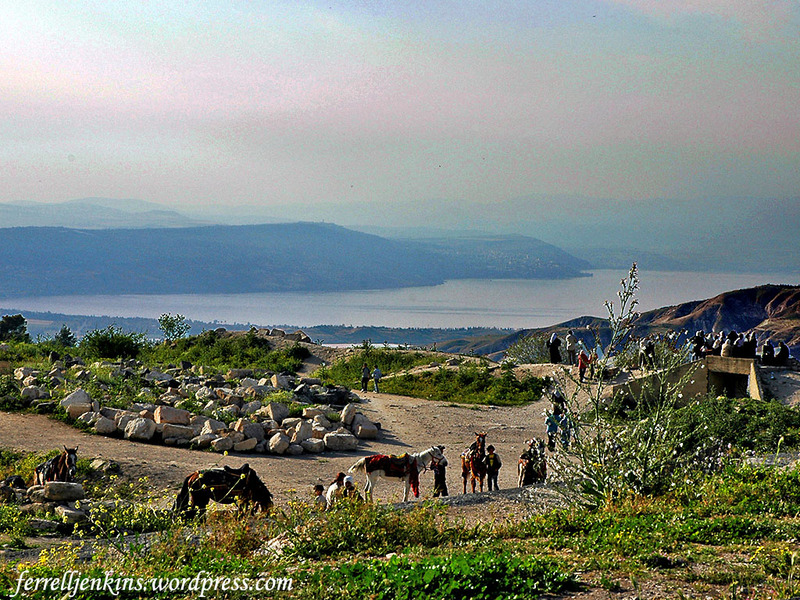 We are told that Jesus visited the region of Decapolis. The Gospel of Matthew informs us about the healing by Jesus of two demon-possessed men in the country of the Gadarenes (Matthew 8:28). Mark puts this event in the country of the Gerasenes (Mark 5:1-20). Luke adds that they “sailed to the country of the Gerasenes, which is opposite Galilee” (Luke 8:26). 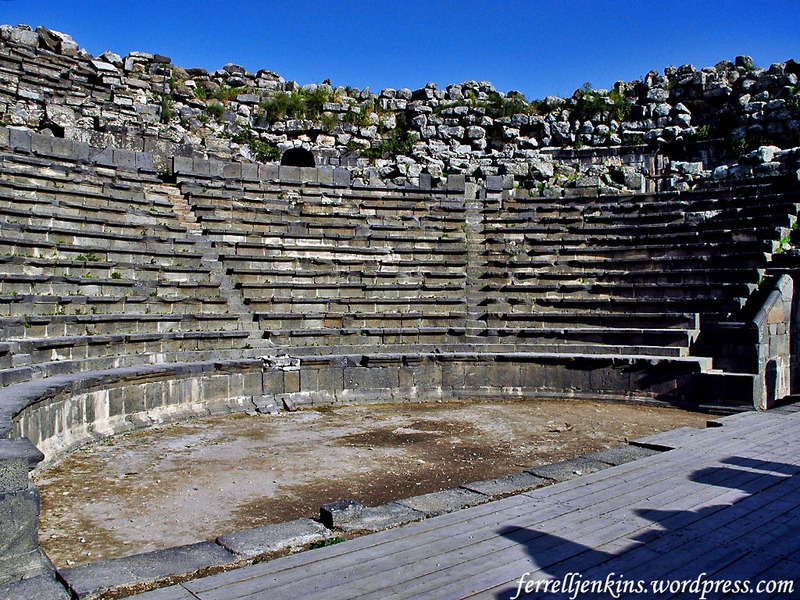 The Roman theater at Umm Qais is made of the local basalt. Photo by Ferrell Jenkins. The term Decapolis was used to describe a group of ten cities established by the Greeks. Many of them claimed to have been founded by Alexander the Great. The number of cities may have been ten at some time, but the exact number varies from list to list. The cities include Abila [Lysanias was tetrarch of Abilene, Luke 3:1], Gadara [Umm Qeis], Gerasa [Jerash], Hippos, Philadelphia [Amman], Scythopolis [Beth-shan], Pella, et al. These cities are located mostly south of the Sea of Galilee, and all except Scythopolis are east of the Jordan River. Damascus is included in some lists. In the first century A.D. they were part of the Roman province of Syria. This entry was posted in Archaeology, Bible Places, Bible Study, Culture, Israel, Jordan, New Testament. Bookmark the permalink. Many thanks. I liked the photo and appreciate your comment. I love your photo of Gadara with the Sea of Galilee!